Literary Elements at work in the story: The story is told by the dog who zealously guards its domain. The colors are soft and calming. Perspective on gender/race/culture/economic/ability: The book has no overt statements to make on gender, race, culture, economic status, or ability. The child is a white girl, but could be any child who owns a dog and/or has concerns about being protected from “monsters” and other evils. Which is your favorite of all the tasks the little dog does? Why? Who protects you and your “castle”? How does this person/animal protect the home? What can you do to guard your castle? Why does the little dog keep the home safe from squirrels, mice, storms, meteors, etc? Why do the protectors of your home do their tasks? 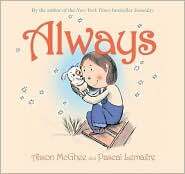 Always by Storypath is licensed under a Creative Commons Attribution-NonCommercial 4.0 International License.